I had to learn how to make a cornbread salad recipe once I tasted it. Recently I tried it for the first time. We were dining at a family style restaurant in Tennessee where they serve all the traditional Southern recipes. The restaurant is called “The Farmer’s Daughter” and I knew right away this place was unique in many ways. We arrived before it opened and right away the people offered us a cup of coffee while we waited. That is Southern hospitality! When we were seated at the Farmers Daughter Restaurant, we were asked what we wanted to drink and what two kinds of meat we would like. Then the food began to arrive at our table. First they brought our bread and cornbread with butter and sorghum molasses. Then we received eleven bowls of side dishes. It was impossible to eat everything but I did take a bite of everything. It all tasted very good but two dishes really impressed me. I knew right away I had to learn how to make a cornbread salad recipe. I have never eaten a cornbread salad before but what a delicious salad. I have made many leftover recipes like stuffing using extra cornbread but never in a salad. This salad recipe was really great. It can be made ahead of time and you can vary the vegetables used in it. When you learn how to make the cornbread salad recipe, you can make easy bowls to serve it in with refrigerated cornbread. Coat a baking sheet with buttered flavored cooking spray. Invert two 10 ounce custard cups several inches apart on baking sheet. Spray outside of baking cups with cooking spray. Separate one can of refrigerated cornbread at perforations. Flatten each strip of cornbread; moisten edges of strips to stick together and cover outside of each cup with dough cutting away excess. Bake in preheated oven at 400F degrees for 10 to 12 minutes. Cool completely on wire rack before filling with salads. Prepare cornbread; add the chilies, taco seasoning and sage. Bake as recipe directs; cool. 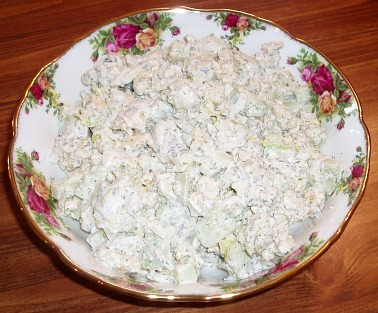 Combine Ranch dressing mix will sour cream and mayonnaise; blend and set aside. Crumble half of CORNBREAD in bottom of a large bowl. 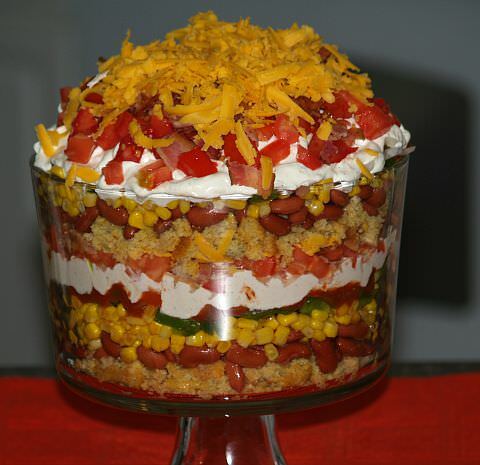 Place a layer with half of BEANS over cornbread crumbs. Place a layer with half of CORN over the beans. On top of corn spread half of SALSA; sprinkle with half of GREEN PEPPER and chopped ONION. Spread half of DRESSING mixture; top with layers of TOMATOES, BACON and CHEDDAR CHEESE. REPEAT with another layer of each; cover and chill 2 hours. In a medium size bowl crumble the corn bread. Add the onions and cucumbers (other vegetables if desired). Add salad dressing, salt and pepper. Toss to blend. Cover and refrigerate for a few hours. Cornbread is referred to as the bread of the South. It was originally called “pone” by the Native Indians. The first corn bread was made of only cornmeal, salt and water. Today we have hundreds of recipes including some delicious Northern sweet cornbread recipes. 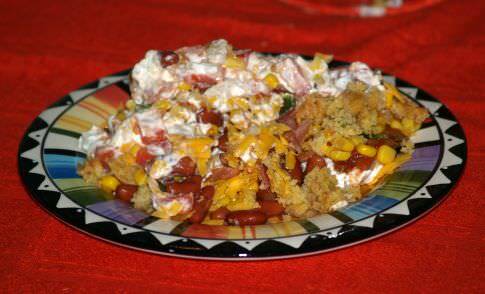 Try the following recipe to use in the cornbread salad recipe. Combine the dry ingredients in a bowl. Stir in the eggs, milk and oil just until blended. Turn into a greased 9x13 inch baking pan and bake for 25 to 30 minutes or until pick comes out clean.